The Exclusive Option Leather C-pillar Seat Belt Outlet Trims feature a hand fitted rich leather surface. These leather crafted Porsche parts are a simple snap-on installation that instantly adds an exclusive look to the C-pillar area of your 911 coupe, complimenting the existing leather you might have. Replacing the hard plastic Trim with rich leather gives your Porsche an exotic feel. 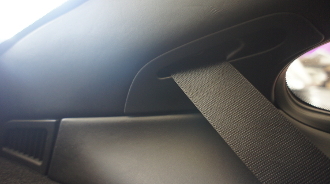 Replacing the hard plastic trim with rich leather gives your Porsche an exotic feel. These small parts make a huge difference in completing an interior worthy of a Porsche 911.